Drew Kampion "2008 Surf Culture"
Prolific and inspiring writer/editor/journalist, Drew Kampion has contributed countless forays of wit, seriousness, and depth to the modern day surf media. Over the past forty years, Kampion has graced the world with the insider’s view to the sport of surfing. His writing spans from contest coverage to profiles, editorials to poetry and everything in between. Most notably recognized for his work with Surfer magazine in the late 1960s and early ’70s, Kampion is largely credited with transforming the somewhat straight shooting sports publication into the innovative, specialty magazine it is today. He was first hired as editor in 1968, the same year his first story was published in Surfer. He continued to improve the magazine, making it a true flexion of the culture it examined. In late 1972, Kampion made the jump to rival publication Surfing Magazine. During his stretch there, the bulk of his writing was focused on interviewing and examining the world’s best surfers. 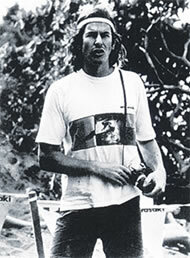 Kampion has also published several books, including Stoked: The History of Surf Culture (1997), one of the best selling surf books of all time. His work has appeared in The Surfer’s Journal, Tracks, Surfing World, Surf Session, Longboard Magazine, and countless other publications. He also served as editor for the Stormrider Guide to North America (2002). His style has been described as murky and ponderous, but also playful. PHOTO: Drew has always had a strong relationship with the stars of surf culture, seen here on the North Shore with 2007 Walk of Fame Surfing Champion inductee Midget Farrelly. 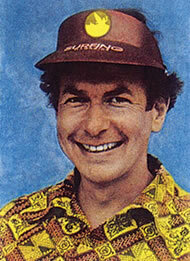 Kampion was born in Buffalo, New York in 1944 and began surfing in California in 1962. After graduating from California State University at Northridge with a degree in English in 1966, he began his career with a brief stint at the Wall Street Journal before letting his passion for surfing take over. PHOTO: Drew on the North Shore beat during the ’70s doing his best impression of Hunter S. Thompson on the job.